Sound, playability and affordability, this little OM has it all. Solid build. Great sustain and harmonics. Delicate sound that will improve with age. Excellent value. In a forest of guitars priced at around £500, how do you make an instrument that stands out from the pack? Well, Aria claims to have worked extensively with luthiers and musicians and investigated superior wood supplies and quality manufacturing, and it seems to have paid off. When it comes to telling the wood from the trees, this new range of instruments really opened our eyes and ears. Aria released the all solid-wood AF-Mirage in 2012, and at the tail-end of 2013, announced the equally all-solid 500 series: a classic dreadnought and an OM, both available with either solid Indonesian mahogany or solid Indonesian rosewood back and sides, designed in Japan and manufactured in Indonesia. With solid Sitka spruce tops, quartersawn non- scalloped spruce X-bracing, sensible prices, and a high level of build quality, fit and finish, they're aimed squarely at the serious amateur and semi-pro market. "Immediately, this guitar has an attractive, friendly air about it"
Here, we're going to focus on the smaller-bodied rosewood 505 OM. Immediately, this guitar has an attractive, friendly air about it. 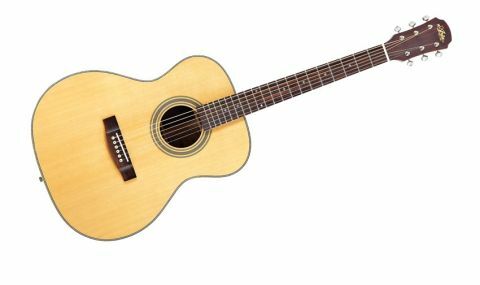 The clean, bright Sitka spruce front is edged with herringbone purfling, which also surrounds the soundhole, giving a clean and summery feel. There's a whiff of the hippy 1970s to the styling, without being fey. The high-gloss finish on the body shows the figure in the mahogany and the rosewood to great effect, and there's a further decorative strip dividing the excellently book-matched halves of the back. A pickguard is provided separately for you to attach, or not: the simplicity of a clean uncluttered front definitely has its appeal. There's a bone saddle and nut, too - certainly not found too often on instruments at this level. Having retrofitted bone nuts and saddles to many guitars from the cheaper plastic ones over the years, it's great to see them as standard here. Using the recently-reviewed Aria 511 for comparison, the OM definitely feels more delicate, catering for the trend towards smaller-bodied acoustics with its slightly shallower depth and smaller waisted body. "It's a delight to play, and it feels more like a parlour guitar"
It's a delight to play, and it feels more like a parlour guitar after the size and boldness of the 511. But considering its comparatively small size, the OM has an impressively loud voice, with all the bright warm responsiveness of the 511, plus a little extra width in the highs and lows: the result, we suspect, of the extra £40 rosewood back and sides. As has been said before, we can't help wondering how these guitars will develop with age and playing time, and how the character that the different woods impart will colour the sounds. Even so, the seemingly small differences in neck profile and body depth already have quite an impact: the OM is really another animal compared to the dreadnought. It lends itself to a different playing approach - more complex than merely strumming versus picking. The OM is a songwriter's friend, an instrument for quieter spaces. The sound remains well balanced, and having lost some of the bottom end that the 511 has in spades, a sweetness and subtlety is revealed. Sustain is key to the sound. The harmonics decay at a remarkably even rate across the frequency spectrum, whether strings are held or left open. If there were any problems with intonation or tuning stability, these would be glaringly obvious, but there are none. This review sample is sensibly set up, too. The action is comfortably low, but still allows for a sensible amount of welly even if you drop the D. And its sound is versatile, too. Fingerpicked, it exhibits a clear folk voice. Strumming? Well, it'll suit anything from gentle blues to smoky jazz accompaniment. Unglamorous as it may sound, this guitar feels and sounds honest and dependable - a very good thing. There are a couple of minor cosmetic/construction blips, but nothing to spoil the party. Essentially, it's a clearly defined, well-made guitar that should develop the more you play it. The 505 invites you to have fun, too, and at this ticket price you won't mind passing it around.